Technical difficulties, folks. Hang on and reload this page until you see the new Scanfest post. This is the fifth post in a weekly series of Online American Digital Archives and Databases found for free at state, county, municipal, college and university history, library, and archive websites, as well as public and private library and museum sites, and historical and genealogical society sites. Talk about your Gold Rush! If you have California ancestors, you'll strike gold with this state's treasure trove of online digital archives, databases, exhibits, and indexes! California State University, Domingo Hills Digital Collection - http://archives.csudh.edu:2006/ - includes South Bay Photograph Collection and the Rancho San Pedro Collection. Subjects in the latter include the city of Compton; houses; agriculture and farming; education; transportation; religious life; oil; early planes; and aviation cartoons. The University's collection includes campus; buildings; students; presidents; commencement, historical publications and yearbooks (1966 - 1977), as well as the history of the university's first twenty-five years. California Underground Railroad - http://digital.lib.csus.edu/curr/ - "...high quality digital images of letters, journals, photographs, documents, newspapers and more to tell the often overlooked experiences of African-American slaves in California..."
California Views - http://www.caviews.com/ - "most comprehensive historical photo collection of the Monterey Bay area"
University of Southern California Digital Library - http://digitallibrary.usc.edu/search/controller/index.htm -includes various photographic, newspaper, rare books, manuscript and postcard collections, bibiliographic database, WPA census cards, employee records and land use survey maps; collections from various groups including the Automobile Club of Southern California, the California Historical Society, and the Chinese Historical Society of Southern California; Japanese American Relocation and Korean American Digital Archives; and much more! Freedom Archives - http://www.freedomarchives.org/index.html - "8000 hours of audio and video recordings documenting social justice movements locally, nationally, and internationally from the 1960s to the present. The Archives features speeches of movement leaders and community activists, protests and demonstrations, cultural currents of rebellion and resistance. King Library Digital Collections - http://digitalcollections.sjlibrary.org/ - this collection documents "the history of the Santa Clara Valley from its agricultural beginnings to the high-tech boom and formation of the Silicon Valley. The range of subjects covered include local politics, social and cultural traditions, education, local business and industry, and historical events." Shades of Corona - http://www.coronapubliclibrary.org/shades/welcome.asp - part of the "'Shades of California' photo history project which is documenting the daily lives and historical, political, and cultural contributions of the diverse communities of California. 'Shades of California' sponsors Photo Days at public libraries throughout the state where people are invited to bring their family albums and personal photograph collections. Community volunteers and project staff select and document photographs which are then copied on-site by professional photographers. These images are archived by the libraries and will be made available to the public at the host libraries." Check out my California Historical Directories and California Historical Newspapers pages. Just a reminder that Scanfest will be held tomorrow, January 31st, from 11 AM to 2 PM, PST here at AnceStories. Don't forget to prep your photos and documents today or tomorrow before Scanfest to facilitate the scanning process. We've gone two months since our last event, so it will be great to catch up with each other and get started on some of those New Year's resolutions for preserving our family treasures. "See" you tomorrow! If you must order an individual vital record, the county clerk’s office is generally a bargain over the state’s vital record department. For instance, I can order a birth record from the State of Michigan online and it will cost me $22.50 plus shipping - or $26 if I order by mail. However, if I order the same birth record from the Muskegon County Clerk, it will only cost me $15.00. Yes, the birth record from the state will arrive on fancy certificate paper, whereas the record from the county clerk will not. However, I know both the county clerk and the clerk at the state office are required to verify the accuracy of the record before they send it out. Paying $7.50 - 9.00 more for the same record to be printed on certificate paper to prove they did so is not worth it to me. 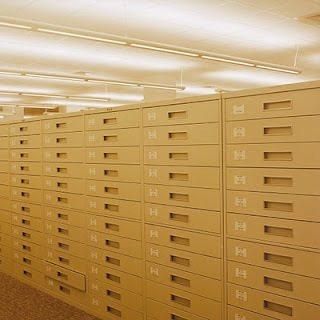 This won't work in every situation, dependent upon which years' records were kept at the county level versus the state level, the laws of each particular state in regard to vital statistics, and the accessibility of vital records to the public. 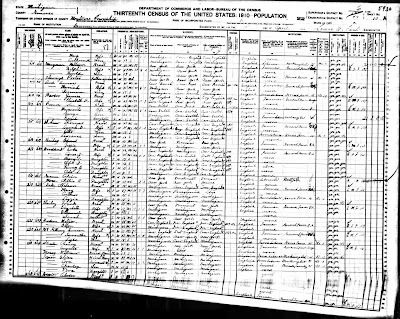 The image above is the 1910 U.S. Federal Census page on which my ancestors James W. BARBER and Elizabeth A. COLE are enumerated. You can click the image above to view an enlarged copy in my online photo album. From the photo album, you can click on the magnifying class in the upper right corner to zoom in even more, as well as pan around the image. Both Ancestry and Family Tree Magazine have free census forms on their websites which can help you view and understand the column headings. I've also created snippets of the above image to make it more viewable and to facilitate the reference to the columns with my comments. This is Montrose Township, Genesee County, Michigan. No village or street names are given, nor house numbers, implying a rural area. You can see that this is dwelling 213 and household 216. James is listed as the head of the household, male, white, age 68. Viewing this image from this magnification, it does look like his age is listed as 69, but when I zoomed in and compared the digit to other nines on the same sheet, it was obvious it was an 8. This age fits correctly with his year of birth, 1841, as his birthday was 4 July and he was enumerated on 15 April (also the official census day). His marriage to Elizabeth was his first one, and they had been married 49 years, placing their marriage year at about 1861, consistent with the fact Elizabeth appears on the 1861 Canadian Census as single (official census date of 14 January) and their first child was born circa 1863. Elizabeth, the wife is listed as a female, white, age 63 (consistent with her 15 October birthday and the 15 April enumeration day), married to James as her first marriage for 49 years. She was the mother of 10 children, nine of whom were living. Their son Benjamin had died 5 August 1888 at the age of six. The next snippet tells us that James and both his parents were born in England, and all were native English speakers. Next, his year of immigration was listed; it is very difficult to read, but by zooming in, I was able to determine it was 1859. I believe this date is James's immigration from England to Canada, not from Canada to the United States for the following reasons: he is shown living in Canada in 1871 on that country's census; his wife was in Canada in 1861; and the 1871 Canadian census and the 1880 U.S. Federal Census show the birthplaces of their first six children were in Canada, spanning the years 1863 through 1875. Furthermore, this date of 1859, in which James would have been about 18 years old, is more consistent with his obituary, which stated that he immigrated at the age of 16. The snippet above also shows he was naturalized by 1910 and in another post I'll share my difficulty in finding any naturalization records for him. The last column tells us he could speak English fluently. Elizabeth's information states she was born in English-speaking Canada (Ontario vs. Quebec) and that her parents were born in New York. While I know for certain her mother (Lavina WILLIS) was born in New York, I have conflicting records on the birthplace of her father (James COLE); some records say Ontario, others New York. His parents came from Vermont, so it's possible they settled in New York during their migration to Ontario. Elizabeth's immigration year appears to be 1857; again, incorrect, as I have found her in 1861 in Ontario on a census. At this time in history, women maintained the same naturalization status as their husbands or fathers, so the naturalization column is blank. She was fluent in English. This last snippet shows that James was a farmer, employed in general farming, and was an employee. There are no marks in the unemployment columns, which mean he was employed. The two columns marked "yes" are for literacy; he could read and write. He rented a farm, and the farm schedule number was 107. If the 1910 agricultural census had not been destroyed by an Act of Congress and instead had been microfilmed, I could obtain a copy and the farm schedule number would help me locate the farm he was renting. It would have given me information on how successful this farm was; what crops were raised, what the harvest had been, how many acres, etc. Since James was renting the farm, he was likely doing the farming for someone else. It's interesting to note that at this time it had been a year since his fall and subsequent injury. As typical for the day, a woman was considered to not have an occupation unless it was paid. Farm work was hard for anyone, man, woman or child, and since James was injured, Elizabeth may have had to do a lot of heavy work to help out, even at age 63. However, whatever work she did was not enough to warrant her being listed as a farm laborer. The last three columns left blank inquired as to whether the person was a Civil War veteran, blind, or deaf and/or dumb. This is important to me, because in the back of my mind, I wondered if James had ever served in the Union Army during the Civil War. Did you know that some 10,000 Ontario men crossed the border to serve in this conflict? One of my step-ancestors and one of my husband's ancestors were among them. I had thought that if this happened with James, it could explain his 1859 immigration date as coming from Canada to the U.S. (and being off by two years, since the Civil War started in 1861). But this blank column assures me that this was not the case. To double check, I did search the 1890 Veterans Schedule and did not find any James Barber living in any of the places in which my James was known to reside. The dates of service of these men also do not coincide well with the birthdates of James's children in Canada. With the exception of the immigration and possibly the naturalization information, everything appears to be correct for James and Elizabeth on this census page. Those of you who've done extensive census research know that this is not always the case! 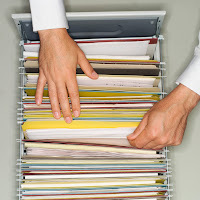 There really is no new information here compared to what I've gathered with other records, but it's always nice to analyze each document to be sure I haven't overlooked anything. In my next post, I'll look at another document from later in 1910 that shows a different residence for James. The January 2010 Scanfest will take place here at AnceStories next Sunday, January 31st, from 11 AM to 2 PM, Pacific Standard Time. It's been two months since our last Scanfest, due to the Christmas holidays. If you would like to be a Producer, please e-mail me no later than Saturday, January 30th at 4 PM, PST and I'll send you an invitation. Preference will given to previous Scanfesters. You must set up an account (free!) ahead of time to be a Producer. This account will be good for all future Scanfests. You can do some practices ahead of time by going to My Account and clicking on the link under Practice your live blogging. Again, you must have IE 6.0+ or Firefox 2.0+ to be a Panelist. This is the fourth post in a weekly series of Online American Digital Archives and Databases found for free at state, county, municipal, college and university history, library, and archive websites, as well as public and private library and museum sites, and historical and genealogical society sites. Check out my Arkansas Online Historical Directories page. 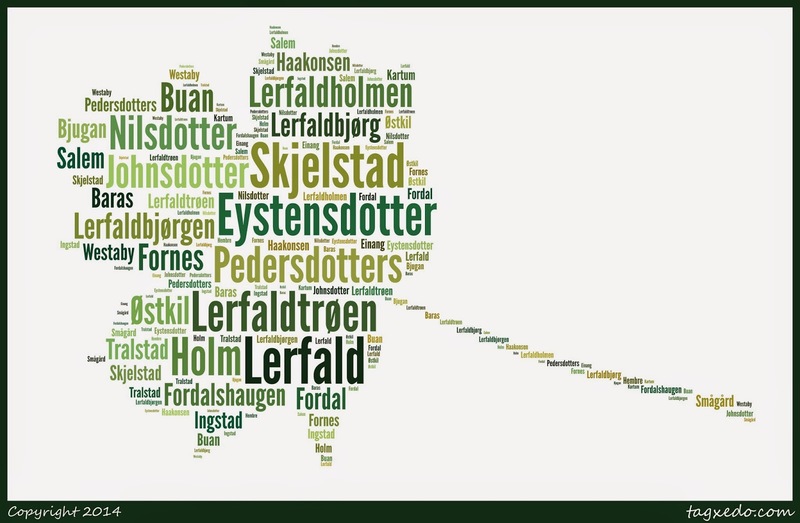 The LERFALD line is my children's father's paternal grandmother's mother's maiden name. Actually, my children's father is descended twice from this line, as his great-grandmother's parents were first cousins to each other. I've been stuck for a long time on how to present this Surname Saturday, because it doesn't follow the nice "template" I've set up for the other surnames I've blogged about for several reasons: Norwegian surnames in the 19th century did not get passed down from father to son as they did in other Western European countries (more on that in a moment); and because my husband's great-grandparents were cousins to each other AND both cousins used the LERFALD surname, it further complicates how this post is written. By the way, these cousins were not children of brothers who used the LERFALD surnames, but of a brother and a sister who used variations of LERFALD. In fact, their daughter, my children's father's great-grandmother, had three of her four grandparents using some form of LERFALD as a surname! Further explanations follow. Norwegians used patronyms until about 1850s in the larger cities, 1900 in most locations, and 1923 everywhere in Norway when a law was passed requiring persons to adopt a permanent surname to be passed from one generation to the next. A patronym is a surname based on one's father's name, and it changes with each generation. So Pedar, Ola's son would be known as Pedar Olason. Pedar's sister Regina would be known as Regina Olasdotter. The women would keep this surname even after they were married. This was very typical in most Scandinavian counties, with slight spelling variations due to the languages used (-sen and -dtr were used in Sweden, for instance). Additionally, in the Norwegian rural communities it was also common to add a second surname based upon the farm you owned or worked on or the community from which you came, and with laborers who migrated from one farm job to another, that second surname would change accordingly. 11. Rena LERFALD: born 25 Sep 1890 in (Zumbrota, Goodhue Co.?) Minnesota; died 12 Jul 1966 in Toppenish, Yakima Co., Washington. 22. Peder Johnsen LERFALD: born 25 Apr 1855 in (Trondheim?) Norway; married 7 Jun 1881 in (Goodhue Co., Minnesota? ); died 16 Aug 1936 in Woodville, St. Croix Co., Wisconsin. 33. Regina LERFALD: born 2 Apr 1859 in near Trondheim, Norway; died 23 Dec 1943 in Eau Claire, Eau Claire Co., Wisconsin. 44. John Nilsen LERFALD: born 21 Sep 1823 in Norway; married 10 Jun 1850 in Norway; died 2 Feb 1911 in Goodhue Co., Minnesota. 45. Sigrid Lassesdotter LERFALDBJØRG: born 5 Apr 1823 in Norway; died aft 1866 in (Goodhue Co., Minnesota?). 46. Ola Pedersen FORDALSHAUGEN: born 6 Feb 1820 in Norway; married 27 Apr 1848 in Norway; died 17 Feb 1872 in Norway. 47. Ane Nilsdotter LERFALDHOLMEN: born 9 Nov 1826 in Lerfaldholmen, Norway; died 7 Dec 1909 in Wisconsin or Minnesota. 88. Nils Pedersen LERFALDTRØEN: born 4 Nov 1787 in Norway; married 29 May 1815 in Norway; died 7 Jan 1867 in Norway. 89. Randi Olasdotter LERFALDHOLMEN: born 4 Apr 1787 in Norway; died 14 Sep 1848 in Norway. 90. Lasse Johnsen LERFALDBJØRGEN: born 1 Jan 1788 in Norway; married 8 Jun 1812 in Norway; died 23 Nov 1858 in Norway. 91. Mali Eriksdotter SMÅGÅRD: christened 9 Sep 1781 in Norway; died 6 Dec 1866 in Norway. 92. Peder Johnsen LERFALD: born 1761 in Norway; married in Norway; died 1858 in Norway. 93. Randi Olasdotter FORDAL: born 1790 in Norway; died 1851 in Norway. 94. Nils Pedersen LERFALDTRØEN: Same as person number 88. 95. Randi Olasdotter LERFALDHOLMEN: Same as person number 89. 176. Peder Andersen LERFALDTRØEN: christened 17 May 1750 in Norway; married 22 Jul 1782 in Norway; died 1810 in Norway. 177. Gudlaug Nilsdotter: born 1752 in Norway; died 25 Dec 1831 in Norway. 178. Ola Eriksen LERFALDHOLMEN: born 1756; married 4 Jul 1782 in Norway; died 9 Jun 1836 in Norway. 179. Marit Johnsdotter: born abt 1751 in Norway; died 6 Jun 1843 in Norway. 180. John Lassesen LERFALD: christened 11 Oct 1764 in Norway; married 8 Nov 1787 in Norway; died 1812. 181. Gunhild Ivarsdotter FORNES: christened 1764 in Norway; died 8 Dec 1854 in Norway. 186. Ola Gunnarsen FORDAL: born 1723 in Norway; married in Norway; died 1803 in Norway. 187. Ingeborg Sivertsdotter SALEM: born 1754 in Norway; died 1808 in Norway. 188. Same as person number 176. 189. Same as person number 177. 190. Same as person number 178. 191. Same as person number 179. 352. Anders Pedersen SKJELSTAD: born 1718 in Norway. 353. Mali Brodsdotter SKJELSTAD: born 1720 in Norway. 360. Lasse Johansen BUAN: christened 15 Aug 1722 in Norway; married 4 Apr 1748 in Norway; died bef 22 Nov 1795 in Norway. 361. Beret Olsdotter ØSTKIL: christened 1721 in Norway; died bef 22 Nov 1795 in Norway. 372. Gunnar Olasen FORDAL: born abt 1691 in Norway. 373. Randi Iversdotter TRALSTAD: born 1686 in Norway. 374. Sivert Guttormsen BARAS: born 1715 in Norway. 375. Anne Invaldsdotter BJUGAN: born 1715 in Norway. 376. Same as person number 352. 377. Same as person number 353. 378. Same as person number 354. 380. Same as person number 356. 382. Same as person number 358. 704. Peder Andersen SKJELSTAD: born 1690 in Norway. 705. Ingeborg Eystensdotter: born 1690 in Norway. 706. Brod Larsen HOLM: born 1680 in Norway. 707. Guri Pedersdotter: born 1680 in Norway. 744. Ola HAAKONSEN: born 1659 in Norway. 746. Iver Gunnarsen KARTUM: born 1659 in Norway. 748. Guttorm Olasen EINANG: born 1690 in Norway. 749. Ingeborg Sivertsdotter SALEM: born 1698 in Norway. 750. Ingvald Olasen BJUGAN: born in Norway. 751. Sigrid Andersdotter INGSTAD: born 1680 in Norway. 752. Same as person number 704. 753. Same as person number 705. 754. Same as person number 706. 755. Same as person number 707. 1490. Jon Gunnarsen FORDAL: born 1620 in Norway. 1492. Gunnar Olasen KARTUM: born 1627 in Norway. 1498. Sivert Andersen SALEM: born 1644 in Norway. 1500. Ola BJUGAN: born 1644 in Norway. 1502. Anders Olasen INGSTAD: born 1643 in Norway. 1504. Same as person number 1408. 1506. Same as person number 1410. 1508. Same as person number 1412. 1510. Same as person number 1414. 2980. Gunnar Johnsen FORDAL: born 1580 in Norway. 2984. Ola Guttormsen KARTUM: born 1600 in Norway. 2994. Bardo Andersen HEMBRE: born 1619 in Norway. 2996. Anders Olasen SALEM: born 1604 in Norway. 3004. Ola Jansen INGSTAD: born 1600 in Norway. 5960. John FORDAL: born 1550 in Norway. 5968. Guttorm Olasen KARTUM: born 1550 in Norway. 5990. Guttorm Aluffsen EINANG: born abt 1580 in Norway. 5992. Ola SALEM: born 1580 in Norway. 6008. Jan INGSTAD: born abt 1570 in Norway. 11936. Ola KARTUM: born 1500 in Norway. 11980. Aluff Arnesen EINANG: born 1530 in Norway. 23960. Arne EINANG: born 1500 in Norway. 1. Online database (I update this at least once a month): LERFALD ancestors and relatives (no info on living persons available) - link brings you to a list of name variations; click on any to see individuals with these surnames. You can also input any surnames, including variations of LERFALD, which I have listed above in my children's father's ahnentafel.. The National Archives and Records Administration (NARA), Pacific Alaska Region, in coordination with The Alaska Network for Understanding American History (ANUAH) is offering free online lessons on Archival Research Basics. Each consists of a Powerpoint presentation and other downloadable materials like worksheets, citations, analysis forms, research logs, etc. These can be downloaded directly from this location at no charge. If you want graduate credit for these lessons, the cost is $90 and you will need to sign up here. The course includes assignments, regular feedback from the archives, and a full day in the Seattle or Anchorage National Archives doing a guided research project. Thank you to Carol Buswell of the National Archives at Seattle for information on this course. FamilySearch Indexing is excited to announce a new Portuguese interface for the program. The first project available in Portuguese is a collection of marriage certificates from Rio de Janeiro, Brazil. Other new projects this week include the 1910 Census for four states, as well as records from Canada and Germany. Thanks to Brenda Wolfgram Moore who recently obtained this Declaration of Intent of my great-great-grandfather, Tjamme "James" Wiegers VALK! There is some great information here, including a physical description of James, confirmation of his birthdate and birth place, address, and immigration information. Although none of this information is new to me, it is nice to have this document in hand and have another piece of evidence for these details. I do wish that Barbara's birthplace was listed, even if it listed Friesland or whichever province in which she was born. She is my brickwall, and I have been having difficulty confirming the birth date I have for her and finding a specific birth place. Until 1922, married women who immigrated to the United State did not have to apply for citizenship, so there will not be a Declaration of Intent for her. I do find it very interesting that this declaration was made on 25 September 1918, since I mistakenly thought James stated on the 1920 Federal Census that he was naturalized in 1897. I took another look at the census and saw that his naturalization status is marked "Pa" meaning he had filed for his First Papers (which is this document, the Declaration of Intent). However, it does state he filed for them in 1897. One thing to consider is that this could be an error; after all, this same census document states he and Barbara immigrated in 1886, but both this Declaration and their passenger list prove they immigrated in 1882. Another thought is that originally James declared his intent in 1897, but didn't move forward to complete the naturalization process, a not uncommon occurrence in those days of laxer naturalization rules. When World War I broke out, many immigrants quickly rushed to complete this process so they would not be under suspicion. With a surname like VALK which could easily be misinterpreted as a German surname, the war might have spurred James on to reapply for citizenship. 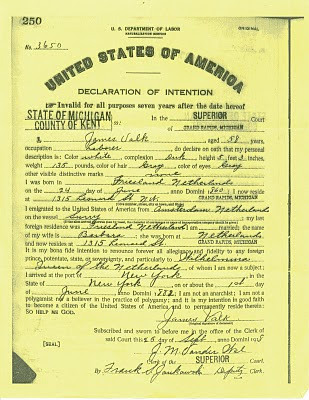 This document does not give James citizenship status. Although he would have met the residency qualifications by this time, he still would have had to file a Petition for Naturalization, and once that was approved, sign an Oath of Allegiance, after which he would have been given a Certificate of Naturalization. I will have to investigate to see if I can find these documents for him. The latter document would be in family papers, if it still exists; the former two would be held with court records. P.S. Tim Agazio of Genealogy Reviews Online recently highlighted his grandfather's Petition for Naturalization, and I noticed that it asked for specific birth information on the petitioner's wife. Since this petition is around the same time period that my ancestor would have petitioned for his naturalization, I am motivated to obtain James's Petition for Naturalization if only to confirm Barbara's birthday and to see if her birthplace is listed on it and is more specific than just "the Netherlands." The 88th Edition of the Carnival of Genealogy has been posted over at Creative Gene. The theme was "Volunteerism!" Jasia has revamped the carnival and it has a whole new "feel" - besides comments here and there on the various submissions, she also showcases a Feature Article. I know that Jasia struggled with the direction the COG had been going, and I'm so excited to see its new rebirth! Jasia announces: "The topic for the next edition of the Carnival of Genealogy will be: Ode to My Family's History! This time around we'll be composing a poem that tells our family's history. It can be long or short, rhyme or not rhyme, funny or serious, illustrated or not... you choose, but make it appropriate as an introduction for a book or video on your family history. The challenge is on! The deadline for submissions is February 1st, 30 submissions accepted." You can submit your piece here. Today I begin a new ten-part series on Frugal Genealogy, based on my most-requested presentation, "Frugal Genealogy, or How Not to Spend a Fortune on Your Family Tree." Each post in this series will focus on one of ten topics I discuss in my presentation, and I freely share one tip from each topic. If you would like me to speak to your group anywhere in the Pacific Northwest on this or any other subject, please contact me. January is one of the best times of the year to restock and/or organize your office. Go into nearly any store and you'll find deals on office supplies and organizing products. 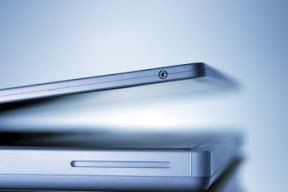 Even if you tend to keep your genealogy file system as paperless as possible, face it: you probably still need some file folders, printer ink, or at the very least, more backup discs. Along those lines, August is another great month for stocking up on supplies, during the back-to-school season. I have two types of cemetery records for James W. BARBER. One is his tombstone photo, taken by another descendant of his and posted on Find A Grave, and the other are sketchy burial records from Mount Morris Cemetery in Genesee County, Michigan. Source: Tombstone of James W. BARBER (1841 - 1912), Mount Morris Cemetery, Genesee County, Michigan. Digital Image photographed by Anonymous (by request). FindAGrave.com. http://www.findagrave.com/cgi-bin/fg.cgi?page=gr&GRid=22128061 : 2010. The year of birth on James's tombstone is 1841, contradicting his age on his death certificate, which calculated to 1839. The 1841 birth year is consistent with most of the records of James's life, however. The memorial page for James (as well as the memorial pages for many other Barber graves in Mount Morris Cemetery listed on FindAGrave) states that the plot is "sec 3 lot 38." The James W. and Elizabeth listed here are the parents of this family. Alex, James A. and John are sons; Clara (Clarissa) is a daughter (her last surname at the time of her death was SINES), and Mary is probably James A. 's wife, Mary HEDGLEN and is likely the "May A. Barber" found at FindAGrave in this cemetery. There actually are more Barber family members buried at this location, according to the author of their memorial pages at FindAGrave. Daughter Lavina (married surname: STREETER) and Nellie ANGUS (wife of Alexander) are also buried in this lot. The same author also created memorial pages at FindAGrave for all BARBER individuals found at Mount Morris. 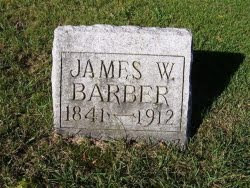 I looked into their death records at SeekingMichigan and FamilySearch Record Search, but after checking birthplaces and birth dates, could not determine--in fact eliminated the possibility--that any of these individuals were likely candidates to be related to James W. BARBER. 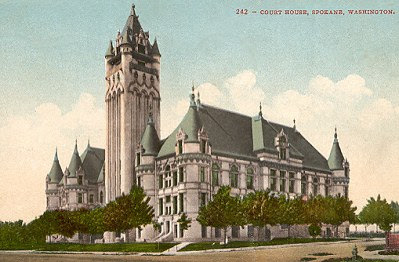 James and his family moved to Lapeer County, Michigan first from Ontario; later they settled in neighboring Genesee County. I did more searches at SeekingMichigan and FamilySearch Record Search on all individuals with the surname Barber or whose father's surname was Barber who died in either Lapeer County or Genesee County, and again could not find any likely candidates. I know that Elizabeth's parents and several siblings immigrated to Lapeer County from Ontario, so it's likely that the reason James and Elizabeth and their family immigrated was to move with her family members (the COLEs) and not with any of James's family members. So far, I've not come up with any possible siblings of James that might lead me further to the discovery of his parents. Next week, we'll look at James's 1910 U.S. Federal Census record. This is the third post in a weekly series of Online American Digital Archives and Databases found for free at state, county, municipal, college and university history, library, and archive websites, as well as public and private library and museum sites, and historical and genealogical society sites. Note: You can search across all the above collections at the Arizona Archives Online site. Check out my Arizona Historical Directories and Arizona Historical Newspapers pages. AnceStories is Four Years Old! I remember and then I forget, I remember and then I forget again...I think middle age has set in! The past two weeks I would remember at odd times that my blogoversary was coming up, but never when I was at the computer to prepare a post for it. Just now, I remembered again! Wow, it's hard to believe I've been doing this for four years! My daughter was a freshman in high school and my son was in 6th grade...a lifetime ago, it seems. The Geneabloggers Group was just a loose-knit community of beginning genealogy bloggers who reached out to each other for support because there were so few of us. Now, there are over 1,500 genealogy blogs listed at the Genealogy Blog Finder, and many of them (845 at the moment) are also listed at Geneabloggers.com! As luck would have it, I don't have much time to reminisce about the past or the evolution of this blog, as I'm on my way to my genealogical society's board meeting. But I wanted to take the time to thank you, my readers, for hanging in there and returning to visit, throughout times of writer's block, computer failures, and crazy busy weeks when I just couldn't find the time to write anything of consequence. While I would still blog about my research (I can't not write!) even if no one visited, having the wonderful feedback and encouragement of all of you has made it so very worthwhile! I often picture you as individuals and as a group as I'm blogging, and always hope that my words communicate my intent well, whether it is to educate, entertain, reminisce, or share my excitement in my latest find. I look forward to many more years of doing this, and hope you enjoy the ride as well! You may know that I am one of three team bloggers that write for the Eastern Washington Genealogical Society blog. One of the other team members is Donna Potter Phillips (you may recognize the name from the many articles she's written for various genealogy magazines, and also as a member of the Salt Lake Christmas Tour guides). The third team member for the EWGS blog is Charles Hansen. Charles is our society's researcher, and is responsible for doing lookups for people who write or email our society asking for help with local records. He's been honored with many awards for his volunteerism for our society, the local public library, and the Washington State Digital Archives. He is a Distinguished Service Member of our society as well. I am writing about Charles because I would like to highlight a series he is doing for the EWGS blog that is just fantastic. Our society will be celebrating its 75th anniversary this year, and in honor of that, Charles has been writing about each of our society's presidents from its inception to the present. He found a scrapbook that was created many years ago, and then has expanded on each president by doing research on them...something Charles knows how to do best! The articles are interesting as they correlate with the history of our society and city; plus, it is engaging to see the different local resources Charles has tapped into to fill out each biography. If your genealogical society has a blog, you might consider imitating this series. Charles also has a personal genealogy blog, Mikkel's Hus. He's become a regular part of the geneablogging community as he participates in carnivals, Randy Seaver's Saturday Night Genealogy Fun, Wordless Wednesday, and the like. I encourage you to "follow" Charles on his blogs, and if you ever have a research question about the Inland Northwest area, please don't hesitate to contact him. He is the go-to person! New index and image collection. Updated collection. Project is now complete! New index and image collection and the second Australia collection. Updated collection. Joint project with the Arkansas Genealogical Society. New index only collection; ongoing project. Updated collection. 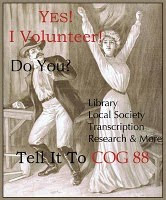 Joint project with the Indiana Genealogical Society. New index and image collection; ongoing project.